As Birmingham's iconic venue celebrates a landmark birthday, we take a look at some of the hall's finest moments, from its opening to the many world-class musicians that graced its stage. 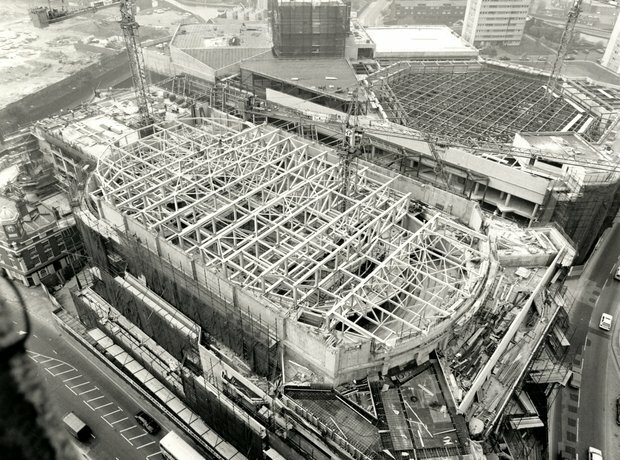 A shot of Symphony Hall in its early stages. The hall is founded on 120 concrete pillars which are interspersed with 800 rubber cushions to reduce vibration from the railway line which runs directly below the site. The hall is also famed for its acoustics - a test carried out demonstrated that if a pin was dropped on stage, the sound could be heard from anywhere in the Hall. The legendary pianist Alfred Brendel bids farewell to Birmingham in 2008. Brendel had been a regular visitor to the hall ever since his cycle of all the Beethoven sonatas in Symphony Hall's second season. His final concert, which took in great works by Mozart, Haydn, Beethoven and Schubert was Brendel's 15th appearance at Symphony Hall. The Orchestra and Chorus of the Mariinsky Theatre team up with City of Birmingham Symphony Orchestra, conducted by Valery Gergiev. The concert, which took place in 2009, also featured tenor Sergei Semishkur. South African trumpeter Hugh Masekela performed with the City of Birmingham Symphony Orchestra in 2010. He performed Jason Yarde’s Flugelhorn Concerto as well as a brand new composition he wrote for the Town Hall Gospel Choir. In May 2012 audiences were treated to a very special screening at Symphony Hall Birmingham of the magical 1939 movie The Wizard of OZ, with live accompaniment from the BBC Symphony Orchestra, conducted by John Wilson.